THEIR MAN IN WASHINGTON Before students at Credo High School walked out to protest school violence, Congressman Mike Thompson addressed the school. 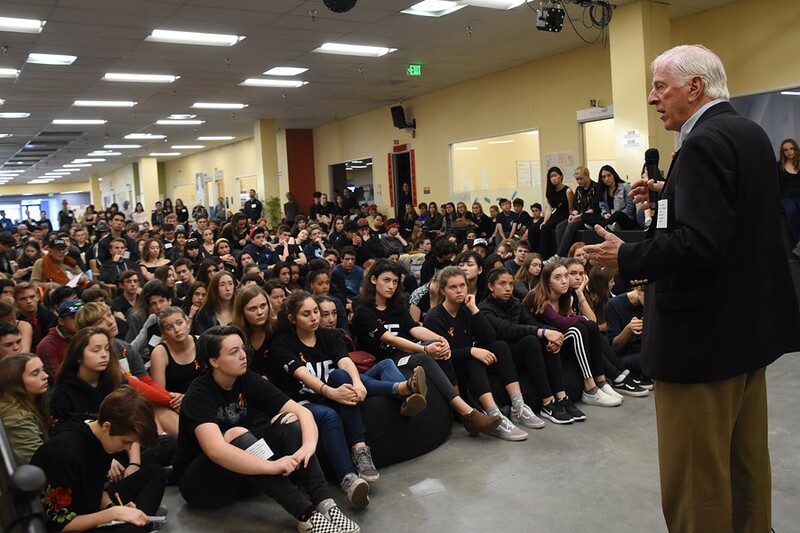 Before participating in the national school walkout against gun violence on Friday April 20, Credo High School students got a visit from Congressman Mike Thompson. The moderate Democrat began his speech at the Rohnert Park school by stating, “I’m a gun owner. I believe in the 2nd Amendment.” Although Thompson has been in the House since 1998—first for the 1st District and now for the reapportioned 5th District—it wasn’t until the Sandy Hook elementary school shooting in 2011 that gun violence became the target for his advocacy. Since then, he has served as the Chairman of the House Gun Violence Prevention Task Force. Here, Congressman Thompson and his colleagues focus on writing policy that has both the biggest effect on citizen safety and the highest chances of being passed in the deeply partisan House. For example, he said, there is not currently enough Republican support in Congress to ban military assault weapons. He himself has opposed any attempt to limit civilian access to high-capacity rifles such as the AR-15. Thompson went on to cite what he believes is the most effective form of gun control: background checks. One of his current bills on this has over 200 co-sponsors—a personal high for Thompson—but only 12 are Republicans. If the Democrats win control of the house this November, he promised that this bill would be one of the first up for a vote. Since nearly all Credo students are constituents of either Thompson or of Congressman Jared Huffman, both of whom are advocates for gun control reform, he advised Credo students who are fed up with the current situation to write fellow high school students in Republican districts to also demand action from their representatives.